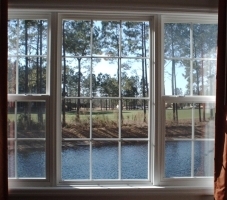 2 Bedroom / 2 Bath units located on the Norman Course at Barefoot Resort!! Built in the heart of the golf capital of the world, Barefoot Resort & Golf represents a new standard in golf vacations. World-class courses, brought to life by Pete Dye, Tom Fazio, Davis Love III and Greg Norman, represent a collection of unsurpassed golf experiences, guaranteeing a vacation experience unlike any other in Myrtle Beach or the world. Comfortable and tastefully furnished accommodations allow you to spread out and relax. Amenities include the use of a community pool. 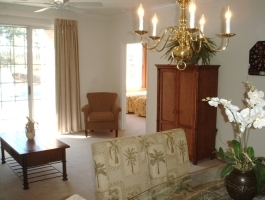 The villas at Barefoot Resort & Golf offer the ultimate resort experience. These 2 bedroom / 2 bath units sleep up to 6 people. Each bedroom can be configured with 2 twin beds or 1 King bed. These units are less than 2 years old and have a great lake view from the patio in back. TV's in every bedroom and the living room. Free wireless internet. Have a group of 8 or more or just want to spread out? We have some units right next to each other. Other size units may also be available. Ask for details.